There’s quite a bit of hoopla about MDM lately, mostly due to awareness. While “Lacks needed data” was cited as the number 1 problem (with 21 votes) in data warehouses in the recent IBM Data Warehousing Satisfaction Survey (2007), “Insufficient or inadequate master data” made a decent showing at second with 17 votes (see Table 3). The new Microsoft MDM site is a good place to start learning about Master Data Management and Microsoft’s efforts in this area. Master Data is a pretty common thing for engineers. I learned about it way back in my manufacturing engineering days. Consider this scenario: Conglomerate C (CC) makes widgets and starts acquiring businesses that also make widgets. CC sells widgets by the pound, but Acquisition A (AA) measures them by counting individual widgets, while Acquisition B (AB) sells them by the case (gross, or 144 ea). CC now wants all this data in a data warehouse so they can compare apples to apples and know, among other things, how many widgets they’re actually making and selling on a given day. Note: Instrumentation and measurement are scientific disciplines in their own rite. There’s a lot more to this, which I hope to cover here and in my new Applied MDM blog. One facet of MDM is standardizing this data. The keys to standardizing this data are recognizing traits in the data types, along with the quality of any proposed conversion. For example, the Cases to Count ratio is most likely stable and predictable. Conversion is easily accomplished using multiplication (or division, depending on which way you go in the standardization). Quality will be high. But the weight to count (individual or case count) conversion is going to be impacted by other factors. Most notably, do all widgets weigh the same? If not, what’s the acceptable tolerance? Quality will be adversely affected by tolerance. Dimensional analysis (the multiplication or division you do to convert known quantities) is also a question about measurement granularity. Trust me: You will want to store as fine a grain as possible. Looking at the sample data, you will want to store WidgetCount somewhere. dbAA is already in this format. Yay. dbAB is easy enough: dbAB.dbo.Widgets.Cases * 144 gives you WidgetCount. Again, the math on widget Weight in the dbCC data becomes fuzzy. But our customer assures us each pound contains five widgets. Five widgets per pound is probably a high quality number. It’s much higher than, say, five hundred or five thousand per pound! “Fuzziness” will impact the integrity of your data. A couple important measures of data warehouse integrity are data accuracy and signal to noise (usually defined by the percentage of “unknowns” in the data). When I have encountered this scenario in the field, I have informed the customer of the dangers and begged them to collect better metrics at the WidgetWeight station for company CC. There are other issues in these examples: date and ID standardization. Dates are fairly straightforward. The IDs can be a little tricky. To standardize the IDs in this example I may consider a LocationID and ProductDateID (ID) composite key on the first pass. I’ve assumed (based on customer feedback) I get 5 widgets / pound from dbCC, and I know the math for the rest. Here I’ve prepared Location data for a star schema via a LocationID and Location table. But I haven’t touched dates and IDs, they will need some work before reaching the destination data warehouse. When I load the destination data warehouse, LocationID maps nicely to the Location dimension surrogate key, while I could simply make the column now labeled ID into a Date dimension surrogate key (removing the Date column from the fact table altogether because it’s now redundant because it’s now redundant). There’s more to Master Data Management, but this is one type of business problem folks are trying to solve when they talk about MDM and how it ultimately relates to data warehouse quality and customer satisfaction. 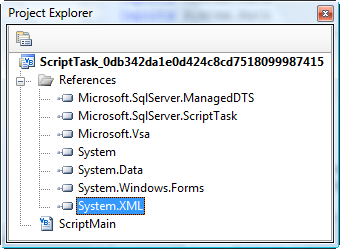 One of the things I appreciate about SSIS is the script elements. There is a lot of functionality built into the engine out of the box but I like the idea of having a Script Task on the Control Flow and a Script Component on the Data Flow just in case. 1. What fun would that be? 2. Seriously, I wanted to avoid the overhead of opening and closing the FTP connection once for each file. I wanted to open the connection, log in, send all the files in a list, then close the connection. Why? It has “I’m not going to be around much longer” written all over it. The only time I use this task is during DTS conversion. Use the Script Task. .Net is fun. You’ll like it, I promise. Poking around the blogosphere, I found some good information and nifty code written by Jamie Thomson to get me started. Note: There are two types of SSIS developers, those who read Jamie Thomson’s blog and those who will. 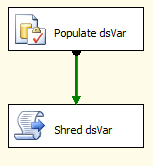 Follow these steps to build an SSIS project that demonstrates how to read (or shred) a dataset in an SSIS Object variable from a Script Task. 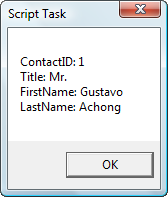 First, create a new SSIS project. I called mine “DatasetVariableInScriptDemo”. When the project opens, drag an Execute SQL Task and Script Task onto the Control Flow canvas. 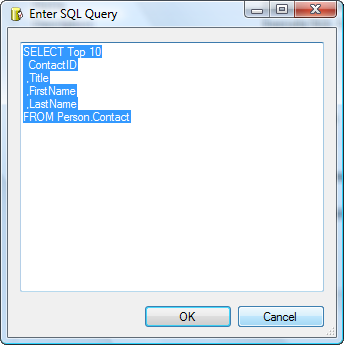 This query returns ten rows from the Person.Contact table. Set the ResultSet property to “Full result set”. Click “Result Set” from the list on the left to map the result set properties to variables. Click the Add button and change the NewResultName text to “0”. 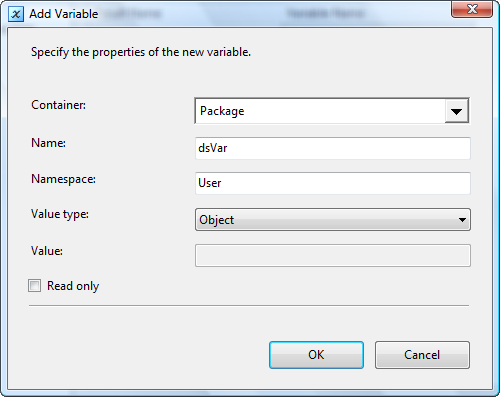 Under Variable Name, click “<New variable…>” and define a new package-scoped, Object type variable named dsVar. Click the OK button to close the Add Variable dialog and create the variable. Connect the Execute SQL Task to the Script Task by dragging an Execute SQL Task precedence constraint (the green arrow visible when you click the Execute SQL Task) to the Script Task. Double-click the Script Task to open the editor. Click Script from the list on the left to open the Script property page. Add dsVar to the ReadOnlyVariables property. 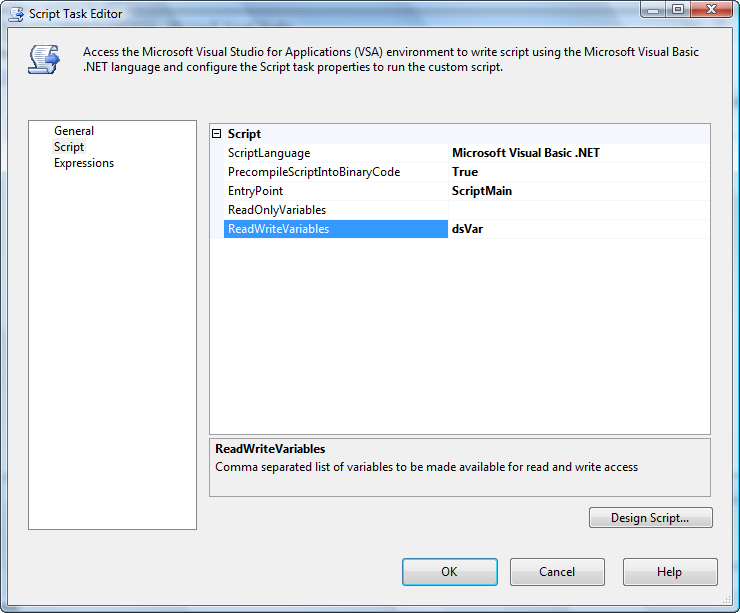 Click the Design Script button to open the Visual Studio for Applications editor. Open the Project Explorer. Right-click the References logical folder and click Add Reference. Select System.XML and click the Add button, then click the OK button to add a System.XML reference. This script uses an OLEDbDataAdapter (oleDA) to fill a DataTable (dt) with the contents of the dsVar SSIS package variable, then iterates each row and column to build a string containing the data in the row. It then pops up a messagebox for each row displaying the row’s contents before moving to the next row. Your code would replace the lines that build and display the message. I like the flexibility offered here. Because of this approach I was able to accomplish my goal of building and re-using a more flexible FTP client in an SSIS Script Task. Richmond Code Camp 4 is Saturday 6 Oct 2007, 8:00 AM – 6:00 PM at ECPI-Innsbrook in Glen Allen, VA (Richmond’s West End). If you’re going to be in the area, stop by and catch a session or two! If you’ve needed to close the information loop in an SSIS Parent-Child package architecture (also known as Master Package Design), Steve Fibich has a post is for you! This is the neatest thing I’ve seen in a long time. Once a child package is called, the parent package variables are available for reference and update – without a single mapping operation. They’re just there. Create a Parent package with a Script Task and an Execute Package Task. Create a int variable named MyParentVar and accept the default value at 0. 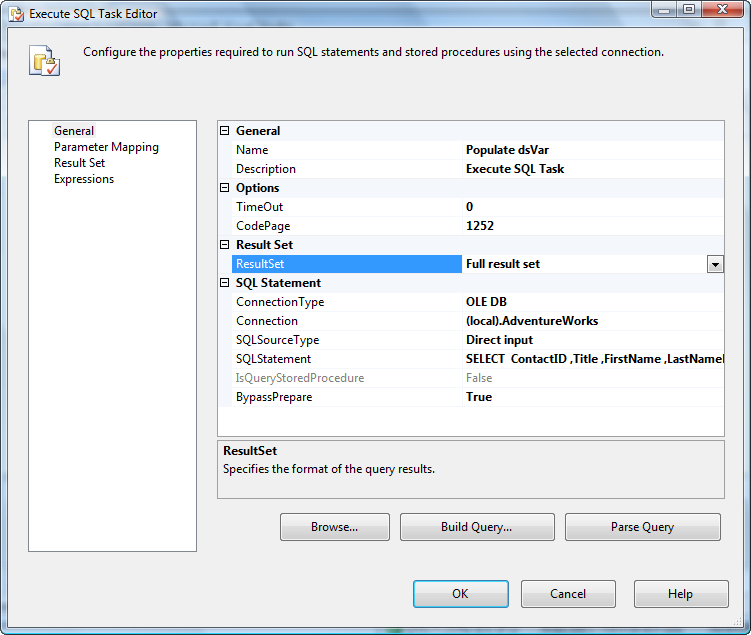 Create a Child package and add an Execute SQL Task. Set up any connection manager for the Task and enter “Select 1 as One” in the SQL Statement property. Set the resultset property to Single Row. On the resultset page set ordinal 0 to MyParentVar. In the Execute SQL Task’s properties you have to set DelayValidation to clear the red X circle. Configure the Execute Package task in the Parent to call the Child package. Copy the Parent package script task and paste it below the Execute (child) Package task. Wire it up so you get a popup, then the call to the child, then another popup. Now. Execute the child. Error – there’s not a variable named MyParentVar in the child. Execute the Parent. Popup 1 says MyParentVar = 0, which it should. Ok that, the child runs and then Popup 2 says MyParentVar = 1. The child updated it – kind of like ByRef arguments in VB. Steve is using this to pass Object Variables containing datasets back up the pipe. The implications of this little trick are astounding! Good work Steve! I’d like to thank the people that attended my sessions at the 2007 PASS Summit in Denver this week! I had a blast and hope you all did as well. The code will be available from the PASS website and on a DVD. For those in my sessions, I promised I would post the code here for my custom Counts test condition for Team Edition for Database Professionals. Free registration at andyleonardconsulting.com is required. If you are completely new to coding and would like to build a custom test condition for database testing, fear not! The last part of Chapter 4 (entitled Testing the Database) of the Wrox book Professional Software Testing with Visual Studio 2005 Team System: Tools for Software Developers and Test Engineers is dedicated to a beginner’s walk-through of building your first custom test condition. Yes I am promoting my new book. There’s a reason: it’s a good book. I am honored and so excited to be presenting a couple sessions at the PASS Summit in Denver next month! One presentation is entitled Applied Team Edition for Database Professionals. The focus is TEDP in action for database development. I cover a lot of the material in my Testing the Database chapter of the new Wrox book: Professional Software Testing with Visual Studio 2005 Team System: Tools for Software Developers and Test Engineers – due out the week before the PASS Summit. Included is a walk-through of how to create and integrate a custom Team Edition for Database Professionals Test Condition. One presentation is entitled Integrate Your SSIS Development. 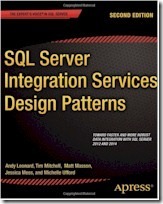 The focus is on SSIS development and testing. I touch on continuous integration and test-first development – using Team Foundation Server for the CI and Team Edition for Database Professionals to test ETL. I use the data collected by ETL Instrumentation in the testing, so this presentation highlights a lot of the pieces of my integrated SSIS development methodology (and previews some upcoming books! ).